Accompanied by two friends and a documentary film duo, Chris Copeland sets out for the deep woods of Alabama to find the beast that killed his father. Chris Copeland recounts a hunting trip with his father taken in Wilcox County on January 4th, 2008. Chris brought a camcorder with him that day to film his first deer kill, but ended up recording the strange disappearance of his father after hearing a gunshot and a roar. Chris’ father’s rifle was found on the forest floor along with blood and a massive footprint. January 5th, 2013 – Five years later, Chris sets out to document video evidence of the creature he suspects is responsible for his father’s presumed death. With his girlfriend Hannah, best friend Jeff, and documentarians Justin and Alex, Chris begins his search by purchasing weapons for protection, renting a German Shepherd named Scout for the trip, and by interviewing Camden, Alabama locals about their reported Bigfoot encounters. After showing the group his plaster cast of a supposed Sasquatch footprint, guitar shop owner Rick McDurmin instructs Chris in how to find a remote mountain man who may be able to help them track the beast. Chris and the others go off the beaten path and ultimately find the man, although he is initially unreceptive to having trespassers on his property. The mysterious man warns the group about multiple creatures and shows them photographs he took of the beasts before he is drawn outside by noises in the trees. Chris and the others use the opportunity to escape the man’s cabin through the back door. January 6th, 2013 – After a night of camping, the five-person crew embarks on a search of the forest. Scout runs off after a scent and Jeff becomes separated from the others when he goes after the dog. Unable to find Jeff, Chris and Hannah return to the campsite. Chris and Hannah investigate knocking sounds during the night and find a skinned rabbit strung up in the trees. Scout returns, but without Jeff. Chris and Hannah eventually find Jeff staking out a shelter made of foliage and branches that may have belonged to a Sasquatch. Tensions among the group later rise back at the camp and something knocks over a surveillance camera while everyone sleeps. January 7th, 2013 – Despite being frightened from the night before, Jeff decides to remain with the expedition. The group finds another skinned rabbit hanging from a tree during an otherwise uneventful search during the day. At night, Jeff falls asleep while on watch duty and the camera catches a shadowy figure stalking behind the tents. January 8th, 2013 – Now distrustful of Jeff’s unreliability, Justin and Alex insist on leaving after reviewing the footage of the creature captured while they slept. Chris chastises Jeff and convinces everyone to commit to one more day of searching. Chris becomes increasingly frustrated with his friends as the day wears on. After night falls, the crew follows Scout to the dead body of a woman strung from a tree, presumably as bait someone set for the creature. Alex abandons the group and runs into the darkness. The others become separated in the confusion when something is heard rustling in the forest and killing Scout. While Chris looks for Jeff, Hannah takes shelter in a cabin and accidentally shoots Justin after confusing him for an attacker. Hannah is then pulled offscreen and killed. Chris finds Justin’s body before he too is killed offscreen. Epilogue text reveals that Alex was later found dead as well, but Jeff’s body was never recovered. A final shot shows the mysterious old man walking through the scene at the cabin before ringing a bell outside. It would be simple enough to pass right by “Hunting the Legend” as one more “found footage” lost-in-the-woods caper, and anyone unwilling to take another swipe at that dead horse would be wise to do exactly that. This is one of those “get a group of your twentysomething friends together with a camera and make a horror movie in a week” affairs, although these friends are truly committed to first-time feature filmmaker Justin Steeley’s homemade Bigfoot thriller. While there may not be anything new of monumental note inside “Hunting the Legend,” there is an admirable sincerity giving the film an edge that less focused indie features can never quite capture. Summarizing the plot won’t take us terribly far into the word count, since the story is a standard setup of searching the forest for signs of Sasquatch after the usual first act of talking heads with townspeople. Random recollections of various Bigfoot encounters bear an air of authenticity as recounted by personable locals, though not one of their stories is the least bit enthralling. It isn’t the inessential value of their runtime-puffing folktales providing a distraction so much as the choppy editing. Interview segments in “Hunting the Legend” have a bad habit of jumbling up each piece with excessive jump cuts. While I definitely appreciate Steeley condensing exposition as much as possible by tightening the ums, ahs, pauses, and flubs, the cuts occur so frequently that I briefly wondered if the DVD was regularly skipping from a persistent glitch. Lending a considerable helping hand in putting the tempo back on pace is a featured trio of amateur actors who are genuinely convincing. They are even more impressive when considering that none of them have any notable prior experience and I presume were hired based on friendship with the director. Or at least a willingness to camp in cold, damp, dark woods. They aren’t Denzel Washington good mind you, but these aren’t the kinds of roles requiring performers of that caliber, either. Almost immediately the trio is drawn up as a smart group since the first things they do together are purchase a shotgun, stock up on rifle ammunition, and rent an attack-trained German Shepherd. Offhand, I can’t recall anyone else in another “found footage” Bigfoot hunt ever taking this level of precaution in case they actually do find what they are looking for. Their wherewithal for preparedness alone puts them leagues above the usual protagonists who instead spend the bulk of their time arguing and getting lost in the trees. Chris Copeland (who can have a career as Joshua Jackson’s stand-in if he wants), Hannah Wallace, and Jeff Causey do both of those things too, but their personalities are mellow enough to keep them likable even when believably bickering. I can’t be sure what may have been scripted and what may have been improvised, yet of all the various tensions exposed in their relationships, nothing comes off as forcibly dramatic. The three of them work as a charming and competent unit of friends. For the most part, “Hunting the Legend” is a scrappy independent effort that does more right than it does wrong. Justin Steeley and friends set out to make a simple movie and they do just that without phoning in their contributions. “Hunting the Legend” has little to show for originality or wow factor, but it does have respectable heart from filmmakers wisely avoiding a reach beyond their means. Which is not to absolve the movie of its problems, as it certainly has them. It needs to be mentioned that the film ends on final scenes that are so chaotic it is nearly impossible to tell what is going on. In addition to the shaky camera and running in the dark madness, everyone is separated, attacked offscreen, and the ambiguity creates more questions than tension. That confusion is compounded by a bizarre audio epilogue that should have been trimmed into a wastebasket instead of appearing in the final cut. Not helping Steeley’s cause any is that by my count, “Hunting the Legend” is now the fifth “found footage” Bigfoot movie released between 2012 and 2014. Sixth if you include “The Frankenstein Theory” (review here), which is mostly the same thing except with a Great White North snowscape instead of a green forest as its setting. In deciding how to rate “Hunting the Legend,” I thought of how it stacked against the other four movies that use an identical premise and format. “Willow Creek” (review here) had a touch more personality to its characters, but was a hollow letdown. “Exists” (review here) is the most exhilarating of the pack, although too much so to be believable. “Bigfoot County” (review here) tried a twist with deviant hunters as its big bad, and then fell flat with barely any Sasquatch sightings. As absurd as many others found it to be, if I were forced to choose one of these five to watch a second time, I would probably choose “Bigfoot: The Lost Coast Tapes” (review here). 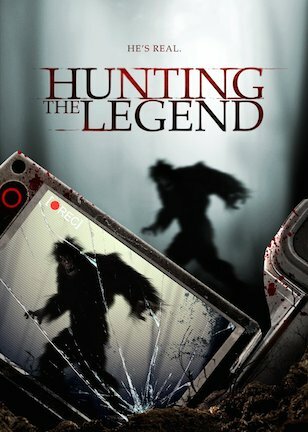 “Hunting the Legend” follows right behind, although ideally, I’d prefer to not watch any more “found footage” Bigfoot movies ever again. June 20, 2014 by Ian Sedensky.